When things don’t go your way, never give up. Play the next play with all you have, from the time the ball is snapped until the whistle is blown. Play from sideline to sideline. Once your block is made, look downfield for someone else to block. 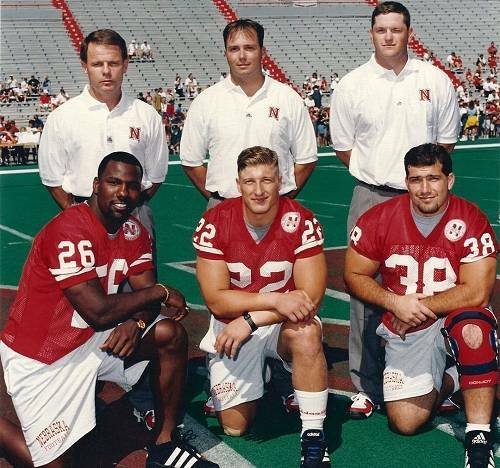 The 1995 Cornhusker team achieved four wins over teams ranked in that season’s final AP Top Ten poll. It shares this dubious honor with only four others, the most recent of which were Oklahoma in 2000 and Notre Dame in 1988. For those out there who may have questioned the validity of the ‘greatest ever’ tag mentioned at the start of this book, know that 1995’s was not a schedule consisting of cupcakes from start to finish. The non-conference schedule was: Big 10’s Michigan State, Pac 10’s Arizona State, Big West Conference’s University of the Pacific (okay, you’ve got me there. One cupcake. ), and Pac 10’s Washington State. As for the conference schedule, on the date of each respective game day Kansas State was ranked #8, a week later was Colorado at #7, followed by Kansas at #10 and then Florida at #2. Also, take note of the margins of victory. For the entire season’s slate they averaged 53 to the opponents’ 14.5 points, with one of the more egregious shellackings being the #1 vs. #2 national championship game in Tempe, Arizona versus the University of Florida Gators. Let it be noted that the Husker Blackshirts tallied seven sacks and three interceptions that night, Mr. Wojo. The historic 62 to 24 beat-down ended with an act of true sportsmanship by Tom Osborne: Nebraska began with the ball on its own 11 yard line and drove the length of the field for the umpteenth time this evening while amassing 631 total yards, only to finish with quarterback Matt Turman mercifully kneeling for a 2 yard loss on the Gator 3 yard line to end the game on downs. Question: So you’re Running Backs Coach, huh? Q: So you were from Nebraska, born and bred, right? CN: I played at Papillion-La Vista High School and then I got hurt 5 games into my senior year at the University of Nebraska. Broke a bone in my neck. Had a bone chip that put me out of it, so I flipped over to the other side as a student assistant for the rest of that season, for spring ball, and then for summer. Then I got a high school job at Papillion-LaVista for two years. Q: You always wanted to play for the Huskers? CN: I don’t know if you’ll want this in the book. (laughs) Actually, I was an Oklahoma fan for a long time. More of a Barry Switzer fan, really. I had a little bit of a wild side going through high school and watching all those Nebraska-Oklahoma wars on TV and the hype surrounding it. I’d go down there to Lincoln to summer camps, though, and finally took my personal visit there just to see for myself how the coaches coached, how the players reacted to the players, the team in general. I visited Colorado, Iowa State, Kansas, and Kansas State, too. Q: The Big 8 tour, huh? How would you compare Nebraska’s recruiting style versus the others? CN: Frank Solich was a lot more honest, when it came to Nebraska. They weren’t trying to pull a lot of B.S. I ended up being a walk-on down there, and it turned out to be between myself and… and I guess it ended up being Aaron Graham as far as who got the last scholarship. And I don’t know if I’d call the other schools’ actions ‘shady’, Nebraska was just a lot more upfront when it came to that; you knew exactly where you stood. When Osborne came to the house you could definitely say that turned it around for me, that I was going there, scholarship or no scholarship. Q: What was your first fall on campus? CN: Fall of ’91. My first practice when it was just freshmen, because the older guys hadn’t reported yet. I figured I could definitely play here, no problem. Then the upperclassmen arrived about 5 or 6 days later and I remember going through our first set of drills as running backs and I found myself on my back the first 5 or 6 reps, laying on the sideline looking up at the skybox. There was Omar Soto, Lance Lewis, Cory Schlesinger, Scotty Baldwin. After that it gets a little hazy. You could tell when a guy’s having a bad day, they would just tell me, “Hey, that’s okay. Things are going to get better. Hang in there. It’s gonna be okay, you’re here for a reason, don’t give up on us.” I was getting knocked down and counting lights that first year, but I just stuck with it. Q: Anything from the organizational aspect stand out? We had an enormous team. We had 130 -140 guys on the field at one time, it was probably the most well-oiled machine I’ve ever been around my entire life. It was so structured, so organized from them doing it for so many years. Everybody knew what was going on as far as the coaching staff, everybody knew their purpose. It wasn’t a deal where anybody was put down or cussed at. When you screwed up they might attack your actions, but not the person. But even then the worst yelling and screaming was kept to a minimum, because they would just talk to you and teach you the game of football. It was that teaching aspect, explaining what you did wrong, explaining it to where you never felt scared to make mistakes. There were some times you’d get ripped, but you had the full gamut of coaches. Some were calmer and never yelled, and others yelled and screamed and cussed a little bit, but in the end everybody would explain what to do. It was a real friendly environment. Coach Solich, my position coach, he was fiery with his actions, but I don’t ever remember him once cussing me or getting after me. Whether it was on the field or off the field making dumb mistakes, but he never ripped ‘em up and then down one end of the field to the other. But he was a tough one. CN: I would say it was the defensive coaches. More intense guys. Coach Steele. Coach McBride was pretty intense. Coach Darlington, who I actually had a chance to work with a few years ago. Q: How was that experience? CN: It definitely is a little different to work with a guy who was one of your coaches at one time. Certain guys like him have forgotten more about football than I’ll ever know. They have a lot of insight and you learned quite a bit in that short period. Q: Your own coaching style… did you gather a lot from them? I’m not gonna attack somebody personally. I might cuss them out and use some fresh language to make a point, but it’s not to a point where you degrade a player. You still want to be teaching them and not cuss & yell just to cuss & yell. Eventually I’m gonna calm down and figure it out and take that guy aside and teach him what to do, otherwise it doesn’t do him any good if you can’t get him to understand it, teach them what you want and how you want them to do it. That’s what I learned at Nebraska. CN: (laughs) Whenever you saw Frank get frustrated, that’s when you avoided eye contact! Q: So you only played 5 games into your last season? CN: Yeah. I partially tore my MCL (which put me out the first game), rehabbed and braced that up, then came back 3 or 4 games into it. And then we had a scrimmage on an off week and that’s when I finally hurt my neck, and it put me out for good. That was in ’95, the Fiesta Bowl year. Q: Could you sense a change in the team from the first day to your last? CN: It felt like a continuation, to me. It was really intense, team oriented. Everybody just had a great sense of confidence: we knew we were good because we were gonna outwork you, we had the best coaches in the country, the best program, great history, and that’s a lot of responsibility to let everyone down. I was a walk-on the entire time. I was never a starter, but whenever I did get in I contributed: special teams and the fullback spot. I was just a team player. We had quite a few, I think 17 walk-ons in that recruiting class: Jeff Makovicka, Steve Volin, Brain Nunns, Wayne Mehlin was actually my roommate and he was the best man in my wedding. He ended up finishing up at Wyoming. Q: When did he leave for Wyoming? CN: Right before his junior year. And he came back after he’d finished his senior year there, he came back again and we roomed together again. I never thought about leaving, ever. I felt like I was contributing. My senior year myself and Jeff Makovicka were in a pretty close running that year, then I had my injuries. I never got into much trouble, I just went to school and focused on football. Q: You always seemed very focused, all business. Would that be a proper characterization? CN: I guess you could say that. Well, you always look back and say, ”I could have done this more or that better”, especially as a coach. When I went to Nebraska, that really helped me to be a coach. To really understand what’s going through a player’s head, a guy who’s struggling and how to deal with it, a guy who thinks he’s a better player than where you have him at? That experience provides me some insight where I can help him get to where he needs to be. Q: What stands out as your shining moment? CN: I wouldn’t say shining moment, but a memorable one would just have been my getting injured, because if not for that, I might not be coaching. Had I stayed healthy and finished out my senior year, who knows what would have happened or what I would have done. So that was an important thing to me, something I won’t ever forget. Q: Tell me more about the neck injury. How did it happen? CN: It happened, actually, during the spring. I had a couple bone chips that broke free, around C-3, C-4, and took the normal x-rays and they couldn’t tell with the x-rays, but I could feel tingling from my neck down. And then I got my feeling back and everything came back normal. And then it happened in the fall -two more times during fall camp- and then the last one put me down for about half an hour, and I took an MRI and actually found 5 or 6 bone chips sticking into my spinal cord. It turns out I was actually suffering paralysis with the bone chips pressing against my spinal cord but it didn’t cut the cord. And the last shot I took moved them and actually pinched it, so I was paralyzed for a half hour. Then I gained my feeling and my mobility again and they decided to take a different look and that pretty much ended it. Q: Who ended up breaking the news to you? CN: Honestly, I don’t recall. I was in a haze when it was happening, the disbelief when they told me I was done. Meanwhile, I would walk around and felt good and didn’t want to believe it. I tried doing the old ‘player deal’ where I asked them to let me sign a waiver and take all the responsibility and keep playing and finish up my senior year, but that didn’t happen.